↑ Colmers WF, El Bahn B (2003). "Neuropeptide Y and Epilepsy". Epilepsy Currents/American Epilepsy Society 2 (3): 53–8. PMC 321170. PMID 15309085. doi:10.1046/j.1535-7597.2003.03208.x. ↑ Kimball JW (May 2008-05-02). 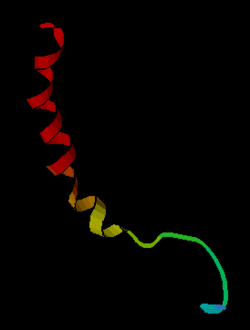 "Neuropeptide Y (NPY)". Kimball's Biology Pages: Hormones of the Gut. http://users.rcn.com/jkimball.ma.ultranet/BiologyPages/G/GutHormones.html#neuropeptideY. ↑ Morris, BJ. (1989). "Neuronal localisation of neuropeptide Y gene expression in the rat brain". J Comp Neurol 290 (3): 358–368. PMID 2592617. doi:10.1002/cne.902900305. ↑ Pomonis JD, Levine AS, Billington CJ (1997-07-01). "Interaction of the hypothalamic paraventricular nucleus and central nucleus of the amygdala in naloxone blockade of neuropeptide Y-induced feeding revealed by c-fos expression". J. Neurosci. 17 (13): 5175–82. PMID 9185555. Ova stranica je zadnji put izmijenjena 15:07, 1 juni 2015.